Josh Stewart, who was seen as one of Bane’s main dudes in The Dark Knight Rises and is the star of The Collector and The Collection, recently completed work as a director on his own horror film. The project is called The Hunted and the film will be showing to potential buyers at the Toronto International Film Festival next month. Stewart co-produced with The Collector producers Brett Forbes and Patrick Rizzotti. Head inside for a synopsis! 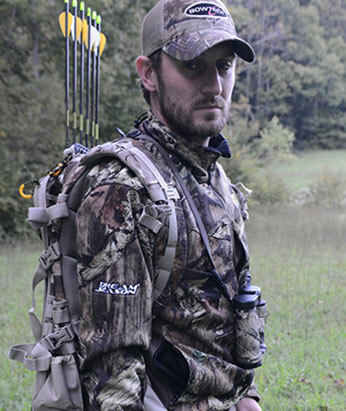 In an attempt to land their own TV show, Jake (Josh Stewart) and Stevie (Ronnie Gene Blevins) head to the dense, secluded mountains of West Virginia. Equipped with only their bow and cameras, they have three days to kill a monster buck big enough to grab the attention of a TV network. Once they find the massive animal, they look to strike fast. But as the sun sets, they realize they’re not alone. A supernatural force appears to be lurking in the vacant woods… and now they’re the ones being hunted.